EL PASO, Texas (Oct. 16, 2018) — Miguel “The Scorpion” Marriaga has had two previous cracks at world championship glory, falling short against Oscar Valdez and Vasiliy Lomachenko. 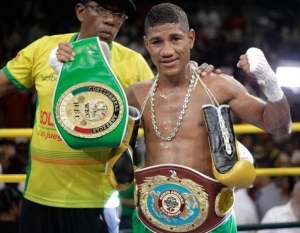 The Colombian puncher’s quest for a third title shot continues Saturday, Nov. 3, when he takes on Jose Estrella (20-14-1, 14 KOs) in an eight-round featherweight bout at the Don Haskins Center in El Paso, Texas. Use the hashtag #BercheltRoman to join the conversation on social media.